Are you a care leaver, care-experienced or estranged student currently studying at university? Thinking about what comes next? Want some advice on living independently? Life After University aims to offer information and help develop some of the key skills required for students to make a successful transition to independent living after graduating, including guidance on applying for jobs or further study, finding accommodation, money management and wellbeing. Click here to download the event timetable. The event will run from 11:00 – 15:30 on Tuesday 27 February 2018 at Fyvie Hall, Regent Campus, University of Westminster. It’s FREE to attend and includes lunch and refreshments. Click here to download the event timetable. 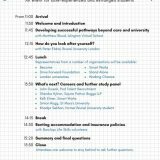 Life After University is put together by the AccessHE Care Experienced and Estranged Students forum and kindly hosted by the University of Westminster. Please contact Sam Turner, London Programmes Coordinator, at sam.turner@londonhigher.ac.uk for further information or to ask any questions.